Ice-stream networks constitute the arteries of ice sheets through which large volumes of glacial ice are rapidly delivered from the continent to the ocean. Modifications in ice-stream networks have a major impact on ice sheet mass balance and global sea level. Reorganizations in the drainage network of ice streams have been reported in both modern and paleo-ice sheets and usually result in ice streams switching their trajectory and/or shutting down. While some hypotheses for the reorganization of ice streams have been proposed, the mechanisms that control the switching of ice streams remain poorly understood and documented. Here, we interpret a flow switch in an ice-stream system that occurred prior to the last glaciation on the northeastern Baffin Island shelf (Arctic Canada) through glacial erosion of a marginal trough, i.e., deep parallel-to-coast bedrock moats located up-ice of a cross-shelf trough. Shelf geomorphology imaged by high-resolution swath bathymetry and seismo-stratigraphic data in the area indicate the extension of ice streams from Scott and Hecla & Griper troughs towards the interior of the Laurentide Ice Sheet. Up-ice propagation of ice streams through a marginal trough is interpreted to have led to the piracy of the neighboring ice catchment that in turn induced an adjacent ice-stream flow switch and shutdown. These results suggest that competition for ice discharge between the two ice streams, which implies piracy of ice drainage basins via marginal troughs, was the driving mechanism behind ice flow switching. In turn, the enlargement of the ice catchment by piracy increased the volume and discharge of Scott Ice Stream, allowing it to erode deeper and flow farther on the continental shelf. Similar trough systems observed on many other glaciated continental shelves may be the product of such competition for ice discharge between catchments. Brouard, E. and Lajeunesse, P.: Ice-stream flow switching by up-ice propagation of instabilities along glacial marginal troughs, The Cryosphere, 13, 981-996, https://doi.org/10.5194/tc-13-981-2019, 2019. Ice flow switching was first invoked to explain the recent stagnation of the Kamb Ice Stream – previously known as Ice Stream C – on the West Antarctic Ice Sheet (Conway et al., 2002). Following this discovery, episodes of ice-stream switching were also inferred to have occurred throughout the Pleistocene and in various paleo-ice sheet settings (e.g., Dowdeswell et al., 2006; Vaughan et al., 2008; Winsborrow et al., 2012). Several driving mechanisms were proposed to explain the switching of ice streams: (i) sediment accumulation causing a topographical change downstream (Dowdeswell et al., 2006); (ii) local variations in bathymetry coupled with relative sea-level change (Stokes et al., 2009); (iii) spatial and temporal variations in basal thermal regime (Ó Cofaigh et al., 2010); (iv) the presence of sticky spots, subglacial meltwater rerouting, and ice thickness variations (Alley et al., 1994; Anandakrishnan and Alley, 1997; Anandakrishnan et al., 2001); (v) competition for ice discharge and drainage basins (Payne and Dongelmans, 1997; Greenwood and Clark, 2009); and (vi) topographic focusing (Sarkar et al., 2011; Storrar et al., 2017). The wide range of possible driving mechanisms outlines the fact that ice-stream switching is a complex process that requires further assessment in order to accurately model the future behavior of modern ice sheets. Empirical data from the paleo-ice sheet record are therefore needed to better constrain the mechanism of flow switching. Networks of glacial troughs on continental shelves may offer such insights for identifying and understanding flow-switching mechanisms as they were overdeepened by past ice streams. These networks generally consist of cross-shelf troughs often interconnected up-ice to marginal troughs (Anderson, 1999; Nielsen et al., 2005; Batchelor and Dowdeswell, 2014). While cross-shelf troughs are broadly aligned with fiords, marginal troughs are aligned parallel-to-coast. Marginal troughs are generally located along the boundary between harder crystalline bedrock in the inner portion of the shelf and softer sedimentary rocks in the offshore portion of the shelf (Nielsen et al., 2005). They have been inferred to result from glacial erosion because they represent an up-ice extension of glacially eroded cross-shelf troughs (Nielsen et al., 2005), but no mechanism has been proposed to explain their formation. Here, high-resolution swath bathymetry imagery combined with archived seismic reflection data and International Bathymetric Chart of the Arctic Ocean bathymetric data (IBCAO; Jakobsson et al., 2012) are used to analyze the morphology and stratigraphy of a single glacial trough network on the northeastern Baffin Shelf in eastern Arctic Canada. These data suggest that up-ice propagation of an ice stream occupying a cross-shelf trough (Scott Trough) eroded a marginal trough (Hecla & Griper Trough), which led to an ice-stream switch. This flow switch resulted in the shutdown of the ice stream occupying the neighboring cross-shelf trough (Sam Ford Trough). The analyzed troughs are located on the northeastern Baffin Island shelf in western Baffin Bay, eastern Arctic Canada. The trough system is characterized by two cross-shelf troughs – Scott and Sam Ford – interconnected by one marginal trough: Hecla & Griper Trough (Fig. 1). Scott and Sam Ford troughs are aligned with the major fiords of northeastern Baffin Island: Scott Trough extends northeast from the mouth of Clark and Gibbs fiord, while Sam Ford Trough extends northeast from Sam Ford and Eglinton fiords (Fig. 1). These four fiords were eroded in Precambrian crystalline bedrock that extends eastward under the sedimentary bedrock strata. Precambrian basement is characterized under the shelf by half-grabens and grabens associated with rifting and spreading in Baffin Bay (Oakey and Chalmers, 2012; Hosseinpour et al., 2013). Post-rifting Cretaceous and Paleocene sedimentary rock strata overlay Precambrian bedrock on most of the shelf (Fig. 1) and are overlain by a relatively thin (<100 m) cover of unconsolidated Quaternary deposits (Praeg et al., 2007; MacLean et al., 2014). Previous studies have proposed that the cross-shelf troughs of western Baffin Bay have a fluvial origin linked to a pre-Quaternary sea-level lowstand (Fortier and Morley, 1956; Pelletier, 1964) much like the troughs of the Labrador Shelf (Josehans and Zevenhuizen, 1987). However, most of the erosion associated with the overdeepening – reaching up to 350–450 m in Scott Trough – may be attributed to subsequent glacial erosion (Løken and Hodgson, 1971). 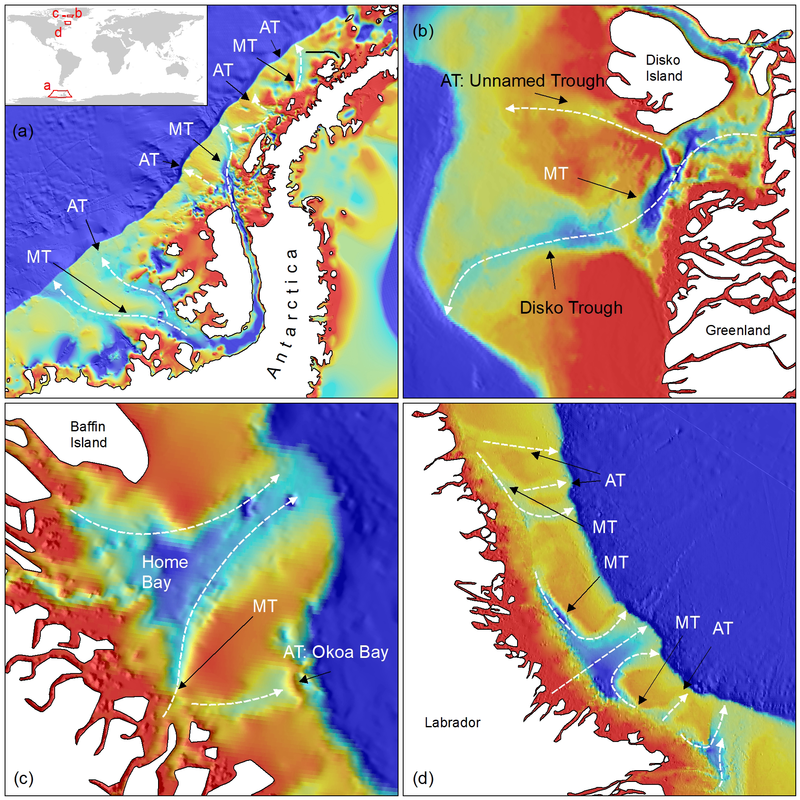 The erosion of the troughs is intrinsically linked to the erosion of the deep fiords of northeastern Baffin Island, which modeling suggests were eroded to present-day depths in ∼1 Myr (Kessler et al., 2008). Therefore, the glacial overdeepening of the troughs probably began during the Pleistocene and erased all traces of preglacial fluvial systems (Løken and Hodgson, 1971). 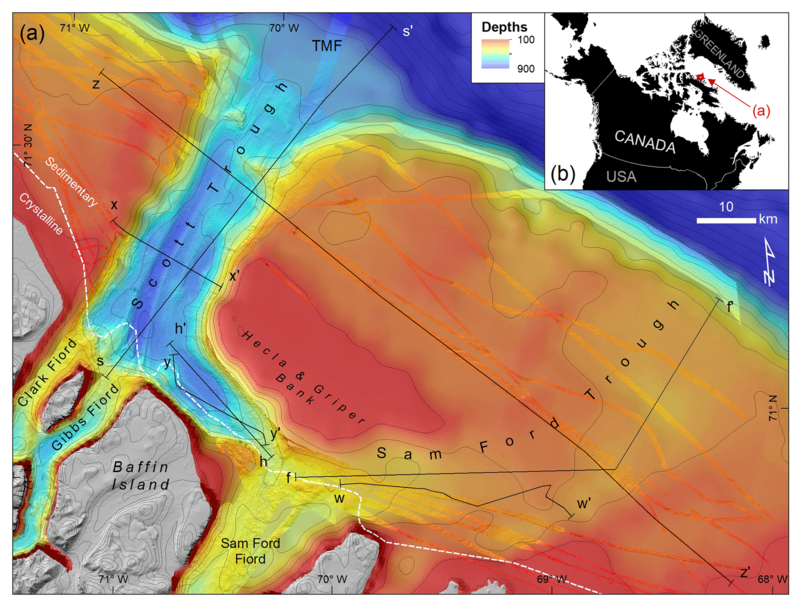 Figure 1(a) Map showing the high-resolution bathymetric data collected by ArcticNet program (2003–2016) draped on the International Bathymetric Chart of the Arctic Ocean data (IBCAO; Jakobsson et al., 2012) map of the northeastern Baffin Island shelf. The black dashed line shows the approximate limit between sedimentary and crystalline bedrock. HGT: Hecla & Griper Trough. Light gray lines: 100 m contours. Dashed black lines: ice-stream lateral moraines on the sides of Sam Ford Trough. (b) Location of the study area. Not much is known about pre-Wisconsinan to Late Wisconsinan ice streams flowing through Baffin Island into Baffin Bay. To produce well-developed fiords, the position of these ice streams was probably stable throughout most of the Pleistocene, i.e., limited to fiords and troughs. Glacial advances – and ice streams – of marine isotope stage (MIS) 5d–b and MIS4 were probably less extensive than during MIS2 (Ganopolski et al., 2010; Stokes et al., 2012; Simon et al., 2014); therefore, ice streams may not have reached the shelf edge between ∼130 ka and 25 ka BP. The last glacial stage (MIS2) reached its maximum around 25 ka BP in western Baffin Bay, with the LIS reaching the shelf edge between Lancaster Sound and Home Bay (Fig. 1; Jenner et al., 2018). During the MIS2 (25–16 ka BP), Scott and Hecla & Griper troughs were inundated by ice streams of the LIS (Briner et al., 2006b; De Angelis and Kleman, 2007; Margold et al., 2015b; Brouard and Lajeunesse, 2017) that extended to the shelf break at the mouth of the troughs, while Sam Ford Trough was occupied by slow-flowing ice (Brouard and Lajeunesse, 2017). Laurentide ice occupied most of the shelf until ca. 14.1 ka BP and deglaciation of the continental shelf was completed by ∼15–12 ka BP as coastal forelands emerged from the glacial ice cover (Briner et al., 2005, 2006a) and LIS outlets retreated to the fiord mouths after 14 ka BP (Brouard and Lajeunesse, 2017, 2019; Jenner et al., 2018). Paraglacial and postglacial sedimentation has been prevailing in the troughs from at least ∼12 ka BP and probably as early as 14 ka BP, which marks a minimum age for the presence of outlets at the fiord mouths (Osterman and Nelson, 1989; Praeg et al., 2007; Jenner et al., 2018). Outlet glaciers of the LIS occupied the entire fiords until ∼11.4 ka BP (Dyke, 2004) before rapidly retreating inland towards the fiord heads (Briner et al., 2009). Finally, glacial scouring observed inland of fiord heads indicates that (i) fast-flowing ice streams may have extended inland of fiord heads and (ii) the fiords were efficient conduits for ice flow and erosion through the coastal mountain range of Baffin Island (Briner et al., 2008). Swath bathymetric data collected using Kongsberg Simrad EM-300 (12 kHz) and EM-302 (30 kHz) multibeam echo sounders onboard the CCGS Amundsen by the Ocean Mapping Group (University of New Brunswick) and the Laboratoire de Géosciences Marines (Université Laval) during the 2003–2016 ArcticNet expedition were used to analyze the seafloor of the Scott–Sam Ford trough system. The metadata for each expedition can be obtained from the Géoindex+ (http://geoindex-plus.bibl.ulaval.ca/, last access: 16 March 2019) and Ocean Mapping Group websites (http://omg.unb.ca/Projects/Arctic/ArcticMetadata.html, last access: 16 March 2019). The multibeam bathymetry data were processed using Caris HIPS and SIPS and merged using MB-System software in order to provide a bathymetric surface at a 10 m grid resolution for interpretation and analyses. The 10 m gridded surface was plotted over the International Bathymetric Chart of the Arctic Ocean data (Jakobsson et al., 2012) to provide complete, but lower-resolution, coverage of the seafloor between multibeam tracks. The complete surface was transferred to ESRI ArcMap 10.2 software for geomorphological mapping and for bathymetric analyses. Individual landforms were digitized in ArcMap 10.5.1 and interpreted based on their apparent character (width, length, orientation, etc.) and the relevant literature (e.g., J. A. Dowdeswell et al., 2016). The interpretation of landform types is detailed in the Results section. Maps were produced in ArcGIS 10.5.1. 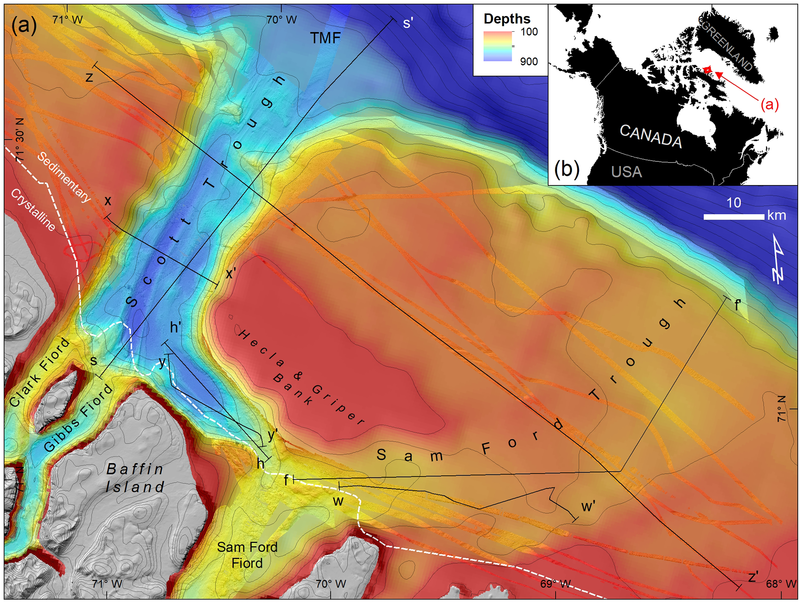 We interpreted seismic reflection data from the Marine Data Holding public repository of National Resources Canada (http://geogratis.gc.ca/, last access: 16 March 2019) in order to provide a subsurface view of the architecture of the shelf. Seismic reflection data were analyzed and extracted using LizardTech GeoViewer software. Seismic reflection data were enhanced using the brightness–contrast tool in Adobe Photoshop CS5 for a clearer visualization. BEDMAP2 data were used for analyzing Antarctica, in search of morphologically similar trough networks, and for map production (Fretwell et al., 2013). Scott Trough is 62 km long, 12 km wide, and 850 m deep. A longitudinal profile across the trough shows that it has a general trend of depths increasing from the shelf edge (∼720 m) to the fiord sills (∼900 m), forming a typical glacial overdeepening (Figs. 2, 3). The trough is also characterized by a Precambrian bedrock sill that forms two bathymetric highs (∼488 m) at about 15 km from the seaward extent of the trough (Figs. 1, 2). The overdeepened basin between the Precambrian bedrock highs and the fiord sill is therefore overdeepened by at least ∼360 m when sediments are not considered. Sediment accumulation over bedrock in Scott Trough is generally <10 m except for small patches in longitudinal basins showing up to 70 m of hemipelagic sediments, turbidites, and mass movement deposits (Fig. 3). The sediments in Scott Trough basins were interpreted as relict (prior to the last glaciation, i.e., pre-Wisconsinan to Late Wisconsinan) deposits that have been preserved from glacial erosion (Praeg et al., 2007); alternatively, they could also result from ice-proximal sedimentation seaward of an ice margin anchored at the fiord mouths, similarly to deposits observed in Sam Ford Fiord (Brouard and Lajeunesse, 2019). The sediments in Scott Trough are mostly confined within longitudinal depressions that have up to ∼130 m of relief to bedrock (Fig. 3). The longitudinal depressions show erosional surfaces that indicate that they are not of structural origin. Air gun profiles on the ridges show that although their upper portion consists of an unconsolidated unit, the basement is marked by strong reflections and hyperbola that are typical of bedrock. The overdeepening in Scott Trough is divided into four longitudinal basins separated by three bedrock and sediment ridges (Fig. 3). The two western basins are aligned with Clark and Gibbs fiords, while the two eastern basins extend into Hecla & Griper Trough. Scott Trough is bounded by steep sidewalls, longitudinal ridges (Fig. 4), and, at its seaward end, a fan-shaped bathymetric bulge interpreted as a trough–mouth fan (Fig. 1; Brouard and Lajeunesse, 2017). The transition from the fiords to Scott Trough is marked by a steep wall and a drop of >450 m (Figs. 1, 2). The transition from the fiords to the trough also marks the transition from the Precambrian crystalline basement to sedimentary (Cretaceous and younger) bedrock (Fig. 1; Praeg et al., 2007). Figure 2Longitudinal depth profile along the ice flow route for each trough. Arrow with a minus (−) symbol indicates a general up-ice decreasing profile of depths. Arrows with a plus (+) symbol indicate a general up-ice increasing profile of depths (glacial overdeepening landward). BH: bedrock high; GZW: grounding-zone wedge. Figure 3Air gun profile across Scott Trough showing glacially eroded basins filled with sediments (LB) and residual bedrock ridges (Profile 78029_AG_266_0758; NRCan). Figure 4Bathymetric profile across the northeastern Baffin Island shelf showing Sam Ford and Scott troughs. The profile also shows the ice-stream lateral moraines on both sides of each trough. Hecla & Griper Trough is 27 km long, 9 km wide, and 780 m deep. A longitudinal profile through the trough shows that it has a general trend of depths decreasing from the junction with Scott Trough (∼840 m) to Sam Ford Fiord sill (∼450 m; Fig. 1). Hecla & Griper Trough is bounded on its southwest side by a steep wall of Precambrian crystalline bedrock (Fig. 1). The northeastern wall is less steep than the western wall and consists of sedimentary rock. The crystalline–sedimentary contact is not apparent on air gun data but, sedimentary structures and layers (parallel inclined reflectors) are apparent below sediments forming the seafloor of Hecla & Griper Trough, indicating that most of the rock underlying the trough is sedimentary (Fig. 5). Hecla & Griper Trough is divided into two longitudinal basins separated by a ridge that extends into Scott Trough. This latter ridge is composed of sediments without any bedrock ridge underneath, implying less geologic control over the development and position of the ridge. The ridge is interpreted as a medial moraine (Fig. 5). Other similar ridges occur in Hecla & Griper Trough but are carved in sedimentary bedrock. 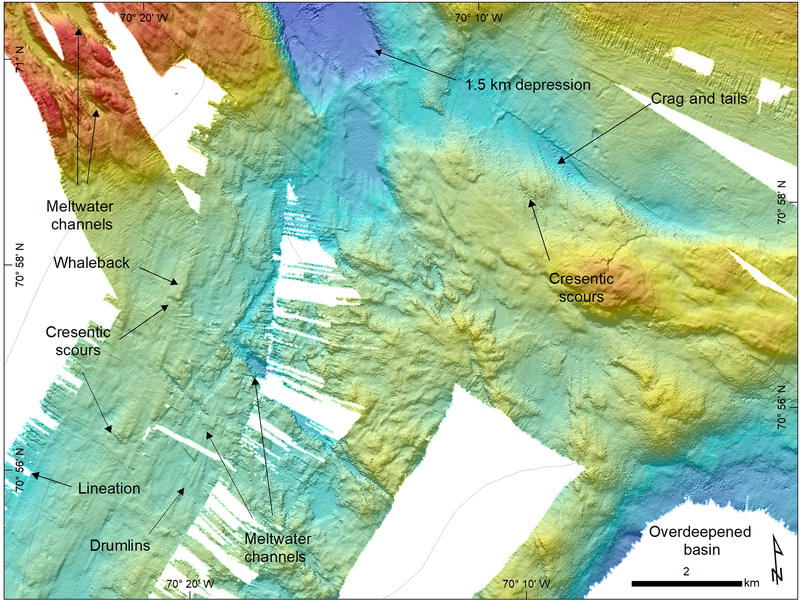 The transition between Hecla & Griper Trough and Sam Ford Fiord is characterized by a 12 km wide plateau to the southwest, by bedrock shoals to the northeast, and by a 1.5 km wide depression between (Fig. 1). Figure 5Air gun profile in Hecla & Griper Trough showing both sediment and bedrock ridges molded by glacial erosion (Profile 78029_AG_268_0110; NRCan). The profile also shows inclined sedimentary strata that were eroded by glacial ice. Sam Ford Trough is 77 km long, 13 km wide, and 370 m deep. Similarly to Scott Trough, the bathymetric profile along Sam Ford Trough shows generally landward increasing depths, but only from the middle shelf. The middle shelf bathymetric high in Sam Ford Trough is not of bedrock origin, but coincides with an accumulation of glacial sediments constructed during the stabilization of an ice margin (Fig. 6; Praeg et al., 2007). Bedrock excavation of Sam Ford Trough exceeds modern water depths by at least 75 m for most of its length and is overdeepened landward by about 200 m. The accumulation of glacial sediments appears on the swath bathymetry imagery as three distinct lobes with one broadly aligned parallel to the trough. Sam Ford Trough is bounded laterally by longitudinal ridges that extend from Sam Ford Fiord sill up to the shelf break (Figs. 1–7). The sill at the mouth of Sam Ford Fiord marks the transition where the fiord becomes the trough. This sill is characterized by a >470 m depression to the south (Fig. 1) and plateau to the north. The southern depression extends to form Sam Ford Trough. The plateau on the northern part of the sill is mainly characterized by crystalline bedrock ridges and flat, sediment-filled basins. Figure 6Seismo-stratigraphic (air gun) profile showing a major 75 m thick grounding-zone wedge (red) in the inner to middle Sam Ford Trough (Profile 80028_AG_RAYT_257_0200; NRCan). Crag and tails are flow-oriented landforms with an identifiable bedrock “crag” at the head and a drift tail (Evans and Hansom, 1996). A total of 202 crag and tails occur within the trough system and on Sam Ford Fiord sill (Fig. 7). The crag and tails have lengths ranging between 98 and 5935 m with a mean length of ∼1071 m. They occur between 254 and 836 m depths, and most of them are located seaward of fiord sills and seaward of bedrock highs in Scott Trough (Bennett et al., 2014). Crag and tails have been widely used in paleoglaciological reconstructions as indicators of ice flow orientation (e.g., Jansson et al., 2003; Kleman et al., 2007; Hogan et al., 2010; Brouard et al., 2016; Brouard and Lajeunesse, 2017). In association with mega-scale glacial lineations (MSGLs), drumlins, and grooves, crag and tails generally indicate fast ice flow and ice streaming. Overdeepened curvilinear depressions (crescentic scours) occur in some cases upstream of crag and tails (Fig. 8). Crescentic scours in front of crag and tails suggest the presence of meltwater (Graham et al., 2009; Graham and Hogan, 2016). Figure 7Distribution of landforms related to ice flow and to ice margin stabilization on the continental shelf and fiords of the study area in northeastern Baffin Island, eastern Arctic Canada. Figure 8Examples of ice flow landforms on Sam Ford sill that are oriented towards Hecla & Griper Trough, eastern Arctic Canada. Drumlins are smooth, asymmetric, oval-shaped hills with a steeper stoss side and a more gentle-sloping lee side (Clark et al., 2009). These landforms occur at depths ranging from 179 to 755 m. The 486 mapped drumlins have lengths ranging between 78 and 1856 m, with a mean of ∼357 m, and are mostly located on the sills of the fiords (Fig. 7). Drumlins have a long axis oriented parallel to ice flow and occur in clusters and in association with glacial lineations, crag and tails, whalebacks, and meltwater channels. Grouped into flow sets, drumlins can reveal paleo-ice flow orientation. Patterns of elongation and convergence of drumlins (together with other ice flow landforms such as MSGLs and crag and tails) can be used as a relative indicator of ice flow velocity; they can therefore be used to identify ice-stream tracks (Stokes and Clark, 2002a). Drumlins are formed under warm-based glaciers (King et al., 2007) and occur in association with meltwater-related landforms such as meltwater channels or crescentic scours (Fig. 8). Glacial lineations are highly elongated (apparent elongation ratio 1:10) parallel ridges formed in glacigenic sediments (Clark, 1993). Most glacial lineations are observed in Scott and Hecla & Griper Trough at depths between 218 and 840 m, where they have lengths ranging from 156 to 8664 m with a mean of ∼1026 m (Fig. 7). They are generally oriented parallel to the troughs. Usually observed in sets, glacial lineations have a soft and mostly regular texture that reflects a sedimentary character (Ó Cofaigh et al., 2005, 2013). In some cases, ridges have a rougher texture that may imply a bedrock character or very thin sediment cover. MSGLs are indicators of fast ice flow, suggesting paleo-ice-stream activity (Clark, 1993; Stokes and Clark, 2002a). Accordingly, they also indicate ice flow orientation. Where MSGLs are covered by grounding-zone wedges, lineations were interpreted to reflect time-transgressive ice flows occurring during the landward retreat of an ice stream (Dowdeswell et al., 2008; Brouard and Lajeunesse, 2017). Grooves are linear to curvilinear negative landforms eroded both in sediments and in bedrock. Grooves usually occur in association and aligned with MSGLs, crag and tails, and drumlins. As with lineations, the grooves were mostly mapped in Scott and Hecla & Griper troughs (Fig. 7). The 465 grooves have lengths ranging between 84 and 5882 m, with a mean of 944 m. They occur at depths between 127 and 838 m. Produced by keels beneath glacial ice eroding the underlying substrate, grooves record paleo-ice flow direction (Graham et al., 2009; Livingstone et al., 2012). The occurrence of grooves alongside MSGLs under present-day ice streams suggests that they are the product of fast ice flow (King et al., 2009; Jezek et al., 2011). Ice-stream lateral moraines (ISLMs) are curvilinear ridges observed on the sides of cross-shelf troughs. They are characterized by a gentle slope on their trough side and a steeper shelf side (Batchelor and Dowdeswell, 2016). In the study area, ISLMs occur on both sides of cross-shelf troughs, except on the sides of Hecla & Griper Trough, probably because of the lack of decent data (Figs. 1–7). These ISLMs are up to 61 km long and 8 km wide. They are believed to be formed subglacially at the shear zone between fast-flowing ice and slower-flowing ice or ice-free terrain (Batchelor and Dowdeswell, 2016). They can therefore be used to delineate the lateral extent of an ice stream (Stokes and Clark, 2002b; Margold et al., 2015a; Brouard and Lajeunesse, 2017). On the swath bathymetry imagery, meltwater channels take the shape of sinuous longitudinal depressions (negative landform) that are generally carved in bedrock (Lowe and Anderson, 2003; Nitsche et al., 2013; Slabon et al., 2018). The 235 meltwater channels occur at depths ranging between 202 and 718 m, and their length varies between 126 m and 4.1 km (Fig. 7). Some channels are characterized by a flat bottom that indicates sediment infill (Smith et al., 2009; Brouard and Lajeunesse, 2019). They form anastomosing networks often extending between ice flow landforms (MSGLs, drumlins, crag and tails). These channels indicate abundant meltwater that could favor ice-bed decoupling, enable basal sliding, and generate ice streaming (Engelhardt et al., 1990; Anandakrishnan and Alley, 1997; Lowe and Anderson, 2003; Reinardy et al., 2011). Subglacial medial moraines are large curvilinear sediment ridges with a smooth character and that are ice flow oriented. On swath bathymetry imagery, they can be overprinted by iceberg plough marks, MSGLs, and grooves. Subglacial medial moraines are thought to be formed subglacially under constraints created by coalescing glaciers (E. K. Dowdeswell et al., 2016). Therefore, they reflect the downstream movement of ice and are indicators of ice flow orientation. Subglacial medial moraines were first identified in Scott Trough (Fig. 7; E. K. Dowdeswell et al., 2016). Subglacial medial moraines were mapped in Scott and Hecla & Griper troughs (Fig. 7), where they reach up to 55.5 km in length. Whalebacks are rough, asymmetric, and oval-shaped hills with a steeper stoss side and a more gentle-sloping lee side (Evans and Hansom, 1996; Roberts and Long, 2005). The 321 whalebacks occur at depths between 170 and 700 m and have lengths ranging between 61 and 1044 m. The whalebacks have a flow-oriented long axis and are generally observed in clusters. In the study area, they occur in association with glacial lineations, crag and tails, drumlins, and meltwater channels (Fig. 7). Grouped into flow sets, whalebacks can be used to reveal paleo-ice flow direction (Krabbendam et al., 2016). Whalebacks are eroded into bedrock and can result from multiple glacial erosion cycles. As with drumlins and crag and tails, overdeepened curvilinear depressions (crescentic scours) can also occur upstream of some whalebacks. Grounding-zone wedges (GZWs) are asymmetric tabular bathymetric wedges (positive landform) that are perpendicularly aligned to trough or fiord orientation. GZWs are characterized on swath bathymetry imagery by an extensive stoss side with low gradients and a steeper and narrower lee side. They occur in Scott (n=4) and Sam Ford troughs (n=3), forming bathymetric mounts (Figs. 1–7). GZWs are formed by the accumulation of subglacial sediments at the grounding zone of an ice stream during temporary standstills of an ice margin (Dowdeswell and Fugelli, 2012; Lajeunesse et al., 2018). They have also been associated with the presence of ice shelves (Dowdeswell and Fugelli, 2012). An ice shelf is believed to restrict vertical accommodation space for sediments in favor of sediment progradation, which explains the low-amplitude and horizontally extensive (up to 139 km2) character of GZWs. In Scott Trough, the occurrence of MSGLs extending to the shelf break, together with a till unit extending on the trough–mouth fan and glacial debris flows on the shelf edge, indicates that the Laurentide Ice Sheet reached the shelf break during the Last Glacial Maximum (LGM; Brouard and Lajeunesse, 2017; Jenner et al., 2018). MSGLs, crag and tails, and drumlins mapped in this region indicate that during the LGM, a tributary ice stream of the Scott Ice Stream extended from Sam Ford Fiord to Scott Trough through Hecla & Griper Trough (Brouard and Lajeunesse, 2017). Accordingly, the medial moraine ridges are interpreted to be the product of differential erosion between multiple ice streams coalescing (E. K. Dowdeswell et al., 2016). While the glacial origin of Scott Trough is obvious from its overdeepening and the numerous ice flow landforms, the glacial origin of Sam Ford Trough is confirmed by the presence of (1) ISLMs, (2) GZWs in the trough, and (3) a small overdeepened basin on Sam Ford Fiord sill (Figs. 1, 6–8). However, the absence of ice flow landforms in Sam Ford Trough suggests that the trough was occupied by slow-flowing ice during the last glaciation. The slow-flowing ice contrasts with a recent glacial reconstruction showing that in full glacial conditions, Sam Ford and Scott troughs were characterized by separate ice streams that drained approximately comparable areas from the LIS (Batchelor and Dowdeswell, 2014). The presence of ISLMs on the sides of Sam Ford Trough, together with an overdeepened basin and a 75 m thick GZW (Figs. 6, 7) in the trough, also indicates that an ice stream originating from Sam Ford Fiord has also been efficient enough to excavate the trough and to flush enough subglacial sediment to construct the multiple GZWs. However, the ice streams in Sam Ford Trough were not efficient enough to build a trough–mouth fan at the seaward end of the trough. The general thickness of paraglacial and postglacial sediments (∼40 m) in Sam Ford Trough also suggests that the GZWs are older than the last glaciation (i.e., pre-Wisconsinan to Late Wisconsinan) and confirms the occurrence of slow-flowing and less erosive ice in Sam Ford Trough during the last glaciation. In comparison, paraglacial–postglacial sediments in Scott Trough never exceed 10 m in thickness outside of the basins. Glacial bedforms on the sill of Sam Ford Fiord indicate that an ice stream flowed from Sam Ford Fiord through Hecla & Griper Trough. Although Hecla & Griper Trough has a structural origin since it was eroded along the crystalline–sedimentary contact, glacial lineations, crag and tails, and grooves within the trough and on the sill of Sam Ford Fiord indicate that it was eroded by an ice stream (Brouard and Lajeunesse, 2017). The bathymetric profile in Hecla & Griper Trough (Fig. 2), showing depths increasing towards Scott Trough, implies that ice-stream erosion was the most effective at the junction between Hecla & Griper and Scott troughs. Erosion of fiords, troughs, and bedrock basin overdeepenings has been shown to be a function of topography, ice discharge, subglacial hydrology, basal thermal regime, basal ice debris, and glacier size (Kessler et al., 2008; Cook and Swift, 2012; Ugelvig et al., 2018). Overall, higher velocities together with thicker ice will generate more basal melt and will accelerate basal sliding and sediment flushing (e.g., Cook and Swift, 2012; Jamieson et al., 2008). Kessler et al. (2008) also demonstrated that topographic steering alone was sufficient to produce overdeepened fiords and glacial troughs. Morphological analyses of bedrock basins in Antarctica and Greenland also indicated a similar erosion process in which ice flow confinement leads to deeper overdeepenings (Patton et al., 2016). These results suggest that if an ice stream – and the associated erosive power – originated from Sam Ford Fiord, Hecla & Griper Trough would be the deepest at its narrowest section, i.e., between the shoals and the shelf. However, Hecla & Griper Trough is the deepest at its widest, i.e., at its junction with Scott Trough. The erosion of Hecla & Griper Trough was therefore more dependent on down-ice dynamics occurring in Scott Trough rather than up-ice dynamics in Sam Ford Fiord. The down-ice dependence of the erosion of Hecla & Griper Trough is in agreement with an inferred strong relationship in the development of interconnected marginal troughs and cross-shelf troughs (Nielsen et al., 2005). Coincident with the contact between crystalline and sedimentary bedrock, Hecla & Griper Trough is therefore interpreted to be the product a tributary ice stream of the Scott Ice Stream, eroding sedimentary bedrock along a weakness line, resulting in a morphology that is similar to other marginal troughs (Anderson, 1999; Nielsen et al., 2005). The down-ice dependence of erosion in Hecla & Griper Trough also indicates that most effective erosion occurred in an up-ice direction. Similarly, analyses of overdeepenings in Antarctica and Greenland showed that below sea level, most of the erosion of overdeepening occurs by headward erosion (Patton et al., 2016). Upstream propagation of high velocities – and erosional power – in ice streams is mainly dependent on instabilities at the ice margin or at the grounding zone; i.e., an acceleration of ice flow can propagate up-ice in the main trunk of the ice stream and up-ice in the tributary ice streams (Hughes, 1992; Retzlaff and Bentley, 1993; De Angelis and Skvarca, 2003; Payne et al., 2004; Kleman and Applegate, 2014). Such up-ice progression of an ice stream can create a positive ice–erosion feedback, in which erosion of the overdeepening causes the headwall to steepen and therefore further enhances sliding velocity and erosional power up-ice in the ice stream (Herman et al., 2011). Therefore, Hecla & Griper Trough, as a host to a tributary ice stream, could have facilitated upstream propagation of ice streaming up to Sam Ford Fiord sill. On Sam Ford Fiord sill, the occurrence of ice flow landforms that are oriented towards Hecla & Griper Trough implies that ice discharge through Sam Ford Fiord was not oriented towards Sam Ford Trough during the last glaciation. Sam Ford Trough is, however, interpreted as the product of an ice stream mainly originating from Sam Ford Fiord and in a minor way from Eglinton Fiord (Margold et al., 2015b). Eglinton Fiord is interpreted as a minor contributor to Sam Ford Ice Stream because of the presence of a GZW (medial subglacial moraine? ), clearly showing that most of the ice discharge came from Sam Ford Fiord (Fig. 7). A possible scenario for the occurrence of landforms associated with an ice stream flowing from Sam Ford Fiord to both Scott and Sam Ford troughs would be that ice flow from Sam Ford Fiord was partitioned between Scott and Sam Ford troughs. Recent research suggests that if Sam Ford and Scott troughs were both occupied by comparable ice streams during full glacial conditions, they would have had similar drainage areas (Batchelor and Dowdeswell, 2014), a similar width, and therefore similar ice discharge (Stokes et al., 2016). The medial moraines and the longitudinal basins in Scott Trough indicate that half of the ice that eroded the trough originated from Sam Ford Fiord. Therefore, ice from Sam Ford Fiord would be responsible for about half of the excavation of Scott Trough, while also being responsible for the excavation of Sam Ford Trough. Accordingly, ice discharge through Sam Ford Fiord would have needed to be twice the ice discharge combined from the neighboring Clark and Gibbs fiords. However, a 2:1 ratio of Sam Ford ice discharge over Scott ice discharge is not compatible with estimates of paleo-ice discharge (1.04:1) and drainage area (1:1) that can be derived from recent models (Batchelor and Dowdeswell, 2014; Stokes et al., 2016). Another possible scenario that could explain the occurrence of landforms related to an ice stream flowing from Sam Ford Fiord to both troughs would be that Sam Ford Fiord ice discharge has always been directed towards Hecla & Griper Trough and that Sam Ford Trough is the product of the most extensive glaciations. During the most extensive glaciations, a part of Sam Ford Fiord ice discharge could be spilled towards Sam Ford Trough to form a shallower trough. An overspill into Sam Ford Trough is unlikely because the last glaciation (MIS2) was the most extensive glaciation in North America since MIS6 (<130 ka BP; Ganopolski et al., 2010; Simon et al., 2014; Stokes et al., 2012) and one of the most extensive throughout the Pleistocene (Ehlers and Gibbard, 2003); there is, however, no evidence for ice streaming in Sam Ford Trough during the last glaciation (Brouard and Lajeunesse, 2017). Also, if ice discharge from Sam Ford Fiord has always been directed towards Hecla & Griper Trough, it is expected that ice would erode, by topographic steering, an overdeepening at the narrowest section of Hecla & Griper Trough (see Sect. 4.2). Nonetheless, a small part of Sam Ford ice discharge could have been advected towards Hecla & Griper Trough from its very beginning and facilitated ice piracy by promoting the up-ice propagation of high velocities into an already fast-flowing ice system. Therefore, partitioned ice discharge between the two troughs is possible but it cannot account for the trough morphology and for the full-scale erosion of both Sam Ford and Scott troughs. As ice partitioning cannot account for the two troughs, a plausible scenario would be that ice from Sam Ford Fiord switched from one trough to the other. Sam Ford Ice Stream would have first eroded Sam Ford Trough and then switched orientation to flow through Hecla & Griper Trough. Following this ice flow switching, the erosion in Sam Ford Trough ceased, while the erosion in Scott Trough was enhanced by increased ice discharge. The difference in erosion volume between Sam Ford and Scott troughs could thus be explained by this mechanism. Here, we propose a mechanism to explain the switching behavior of an ice stream that incorporates some of the switching mechanisms invoked in previous studies but in which the flow switch of Sam Ford Ice Stream is due to long-term erosion by up-ice-propagating ice streams (i.e., Scott Ice Stream). Ice streams propagating upstream and eroding Hecla & Griper Trough have eventually eroded the marginal trough to a point at which it extended to reach the mouth of Sam Ford Fiord. The changes in the depth to bedrock resulting from the upstream erosion by Scott Ice Stream in Sam Ford system led to the (1) reorganization of the ice drainage system through the switching of Sam Ford Ice Stream from Sam Ford Trough to Scott Trough and, ultimately, (2) the shutdown of Sam Ford Ice Stream in Sam Ford Trough (Alley et al., 1994; Anandakrishnan and Alley, 1997; Graham et al., 2010). Such ice piracy through the switching of ice streaming most probably occurred early during Pleistocene glaciations: it is probable that ice streaming in Sam Ford Trough only occurred during a short period at the beginning of early glaciations, before its ice discharge got captured by the Scott Ice Stream. As this process repeated itself throughout glacial cycles, it accentuated the depth of Hecla & Griper Trough, which in turn facilitated the capture of Sam Ford Ice Stream by Scott Ice Stream during subsequent glaciations. The changes in the depth to bedrock associated with the upstream propagation of Scott Ice Steam in Hecla & Griper also led to a point in time when the ice discharge of Sam Ford Fiord switched to be topographically diverted towards Hecla & Griper (i.e., the 1.5 km wide depression). From that point on, ice-streaming conditions were unlikely to occur in Sam Ford Trough and could explain (1) why Scott Trough is more than 2 times deeper than Sam Ford Trough and (2) the absence of a trough–mouth fan at the seaward end of Sam Ford Trough. Taken together, these observations suggest that the erosion and the morphology of the troughs on the northeastern Baffin Shelf are a function of competition for ice drainage basins. This process shares striking similarities with fluvial drainage basin reorganizations linked to river captures (Bishop, 1995): a dry valley (Sam Ford Trough) with glacial deposits (instead of fluvial, i.e., the GZW) and a knickpoint (the 1.5 km wide depression at the head of Hecla & Griper Trough). An ice drainage piracy mechanism similar to river captures in fluvial systems can probably not explain the occurrence of all the other cross-shelf troughs that do not extend up-ice to the coast or to fiords, mainly because each have different geological, glaciological, and climatic contexts. However, morphologically similar systems occur on many formerly glaciated continental shelves: e.g., small troughs along the Antarctic Peninsula (Fig. 9a) and Pennell Trough on the West Antarctica Shelf; an unnamed trough on Disko Bank on the West Greenland Shelf (Fig. 9b); Okoa Bay on the Baffin Shelf (Fig. 9c); small cross-shelf troughs off the coast of Labrador and Newfoundland (Canada; Fig. 9d); and Angmagssalik Trough on the East Greenland Shelf. Much like Sam Ford Trough, these cross-shelf troughs are shallow and oriented towards a fiord that probably fed an ice stream during full glaciation. However, these shallower troughs do not reach the fiord mouth because they are all intersected by the marginal trough of a deeper adjacent cross-shelf trough, suggesting that (i) they were cut off from their glacial ice supply and (ii) their ice stream was probably shut down, similarly to Sam Ford Ice Stream. Such abandoned and less eroded cross-shelf troughs – intersected by marginal troughs – on most formerly glaciated continental shelves of the world could result from a similar mechanism to the Scott–Sam Ford system. However, further investigations are needed to confirm that competition between ice streams also played a role in the development of these trough systems. Figure 9(a) Bathymetry (BEDMAP2; Fretwell et al., 2013) of the western continental shelf of the Antarctic Peninsula. MT: marginal trough. AT: abandoned trough. White dashed lines: interpreted ice-stream tracks. Inset: location of (a–d). (b) Bathymetry (IBCAO) of an unnamed trough and Disko Trough off West Greenland. MT: Marginal trough. (c) Bathymetry (IBCAO) of Okoa Bay, Home Bay, and marginal troughs off eastern Baffin Island. (d) Bathymetry (IBCAO) of Labrador Shelf troughs off Labrador, Canada. Although the competition for ice drainage basins between ice streams has long been recognized as a driver for changes in ice sheet geometry (Payne and Dongelmans, 1997; Greenwood and Clark, 2009), this mechanism has not been given much attention compared to other hypotheses for switching as this idea has only been derived from modeling studies. However, the geomorphology, pattern, and glacial trough assemblages in the Scott–Sam Ford system provide for the first time an empirical context in which adjacent ice streams on a continental shelf could have interacted in competition for ice discharge during the Pleistocene. The erosion profile of Hecla & Griper Trough indicates that (i) this competition was dependent on glaciodynamics occurring down-ice, probably at the marine-based ice margin, and (ii) that the upstream propagation of ice instabilities (or ice acceleration) occurring down-ice play a fundamental role in organizing ice flow routes within the ice sheet. Felikson et al. (2017) modeled such up-ice propagation of a wave of thinning due to changes in ice margin thickness. The hypothesis of instability waves propagating upstream in ice streams and outlet glaciers has also been mentioned in a series of recent papers (e.g., Felikson et al., 2017; Nick et al., 2009; Price et al., 2011; Reese et al., 2018). The erosion of Hecla & Griper Trough confirms such a wave theory: instability waves traveling up-ice were redirected along the line of weakness along the sedimentary–crystalline contact, which enabled the formation of a tributary ice stream that eroded Hecla & Griper Trough. Redirection of the instability wave was probably due to (i) differential erosion and (ii) the competition between advection and diffusion of the wave (Felikson et al., 2017). Differences in bedrock lithologies probably favored differential erosion rates that eventually resulted in a topographic step (steep bed profile) at the transition between crystalline and sedimentary bedrock. The topographic step favored relatively thin ice and a steep ice profile, in which down-ice advection dominated and thus limited up-ice diffusion of ice streaming. Conversely, the cross-shelf trough forms a relatively flat bed with flat ice profiles, in which diffusion of the wave could have dominated. In this setting, the diffusion of the wave was promoted on the shelf along the transition between crystalline and sedimentary bedrock where the bed profile was the flattest. Long-term erosion along the bedrock contact could then have led to the erosion of a marginal trough. The development of a marginal trough was a key structural element to produce a positive feedback that facilitated the redirection and diffusion of up-ice acceleration. The competition between adjacent ice streams on the continental shelf was therefore “won” by the ice stream that was the most efficient at diffusing its fast flow up-ice through its tributaries, i.e., through a marginal trough. The competition between ice streams and their switching on and off implies important configuration changes in ice-stream and ice sheet geometries. Inland thinning of ice sheets can be controlled by ice margin geometry (Felikson et al., 2017), and therefore the competition for the ice drainage basin should have a major influence on the growth and decay of an ice sheet. Accordingly, abrupt changes in ice-stream networks are expected to influence ice sheet stability. Where switching occurs and leads to the merging of two ice streams, the ice flow acceleration can propagate upstream in both glacial drainage basins (i.e., in both Scott and Sam Ford in the study area). Merged ice streams can then affect a greater area of the ice sheet and lead to ice-divide migration (Greenwood and Clark, 2009). Such flow switching of ice streams can provide more efficient and rapid pathways for continental ice to reach the ocean, possibly leading to a more rapid drawdown of the ice sheet. The merging of ice streams through ice piracy should result in an increase in ice discharge and erosion rates in the “winning” trough. The winning ice stream gains mass balance and should consequently equilibrate by advancing its margins if it has not already reached the shelf break. The seaward extent to the shelf break of Scott Trough and its overdeepened bedrock basin cannot be unequivocally attributed to ice-stream switching. However, the longitudinal basins originating from Sam Ford Fiord represent almost half of the width of Scott Trough. These basins suggest that the switch could account for up to half of the erosion of Scott Trough. Ice-stream switching through marginal troughs can therefore lead to more extensive glaciations and to the erosion of deeper glacial troughs on high-latitude continental shelves. Increasing depths behind grounding zones are known to create a positive feedback during glacial retreat that results in faster retreat of the ice margin in progressively deeper waters (Mercer, 1978; Schoof, 2007; Joughin and Alley, 2011). Therefore, the erosion of a marginal trough leading to a flow switch is expected to make ice sheets occupying similar trough systems on continental shelves more sensitive to climate forcing, in both the short (within a glacial cycle) and long term (over multiple glacial cycles). The swath bathymetry imagery and geophysical data collected in a simple trough network of the northeastern Baffin Island shelf (Arctic Canada) provide evidence for the flow switch of an ice stream that occurred during the Pleistocene on the northeastern Baffin Island shelf (Arctic Canada) through glacial erosion and overdeepening of a marginal trough. The glacial geomorphology of the seabed and the erosion profiles of the trough network provide for the first time an empirical context in which adjacent ice streams could have interacted in competition for ice discharge. This competition for ice discharge between ice streams was dependent on dynamics occurring at the marine-based ice margin (i.e., the grounding zone), indicating that the upstream propagation of high glacial velocities plays a fundamental role in organizing ice flow routes and catchments within ice sheets. Such merging of glacial ice catchments by switching provides more efficient and rapid pathways for continental glacial ice to reach the ocean, enhancing the extent and erosive action of ice streams on high-latitude continental shelves. These results suggest that the up-ice propagation of high ice velocities is a major driver of changes in the geometry of ice sheets during their growth and decay and can therefore affect ice sheet stability. The hypothesis that the ice-stream switching mechanism plays a major role in the geological evolution of formerly glaciated continental shelves through the extension of marginal troughs is supported by other examples from continental shelves located at the former margins of the Laurentide, the Greenland, and the West Antarctic ice sheets. These trough systems show striking morphological similarities with the trough network described on the northeastern Baffin Shelf and could also result from competition between adjacent ice streams. As paleo-dynamics inferred from Canadian Arctic continental shelves can be used as an analog to understand how modern marine-based ice sheets will respond to future climate change and sea-level fluctuations, these results highlight the need for further observations and modeling studies that should include ice drainage competition between ice streams and the resulting flow capture as a major control on ice sheet stability. The multibeam bathymetry dataset can be visualized and requested on the Université Laval Géoindex+ website (http://geoindex-plus.bibl.ulaval.ca/, last access: 16 March 2019). The seismic reflection data, along with the acquisition specifics, are available on the Geological Survey of Canada website (http://ftp.maps.canada.ca/pub/nrcan_rncan/raster/marine_geoscience/Seismic_Reflection_Scanned/, last access: 16 March 2019). EB and PL developed the study. EB interpreted the geophysical datasets, wrote the paper, and prepared the figures. PL helped with the interpretation and analysis and contributed to the writing and editing of the paper. We sincerely thank the captains, crew, and scientific participants (particularly Gabriel Joyal, Annie-Pier Trottier, and Pierre-Olivier Couette, Université Laval) of ArcticNet cruises 2014–2016 onboard the CCGS Amundsen. We also thank John Hughes Clarke and his team at the Ocean Mapping Group (University of New Brunswick), who collected swath bathymetry data in the region between 2003 and 2013. We thank Jean-François Ghienne (CNRS), Calvin Campbell (NRCan), Martin Roy (UQAM), and Pierre-Olivier Couette (ULaval), who provided helpful comments on a previous draft of the paper. We also thank the two anonymous reviewers as well as the associate editor Chris Stokes for providing valuable comments that improved the quality of the paper. This project was funded by ArcticNet Network Centres of Excellence and NSERC Discovery grants to Patrick Lajeunesse. This paper was edited by Chris R. Stokes and reviewed by two anonymous referees. Alley, R. B., Anandakrishnan, S., Bentley, C. R., and Lord, N.: A water-piracy hypothesis for the stagnation of Ice Stream C, Antarctica, Ann. Glaciol., 20, 187–194, https://doi.org/10.3189/172756494794587032, 1994. Anandakrishnan, S., Alley, R., Jacobel, R. W., and Conway, H.: The flow regime of Ice Stream C and hypotheses concerning its recent stagnation, The West Antarctic Ice Sheet: Behavior and Environment, 77, 283–294, https://doi.org/10.1029/AR077p0283, 2001. Anandakrishnan, S. and Alley, R. B.: Stagnation of Ice Stream C, West Antarctica by water piracy, Geophys. Res. Lett., 24, 265–268, https://doi.org/10.1029/96GL04016, 1997. Anderson, J. B.: Antarctic marine geology, Cambridge University Press, Cambridge, UK, 297 pp., 1999. Batchelor, C. L. and Dowdeswell, J. A.: The physiography of High Arctic cross-shelf troughs, Quaternary Sci. Rev., 92, 68–96, https://doi.org/10.1016/j.quascirev.2013.05.025, 2014. Batchelor, C. L. and Dowdeswell, J. A.: Lateral shear-moraines and lateral marginal-moraines of palaeo-ice streams, Quaternary Sci. Rev., 151, 1–26, https://doi.org/10.1016/j.quascirev.2016.08.020, 2016. 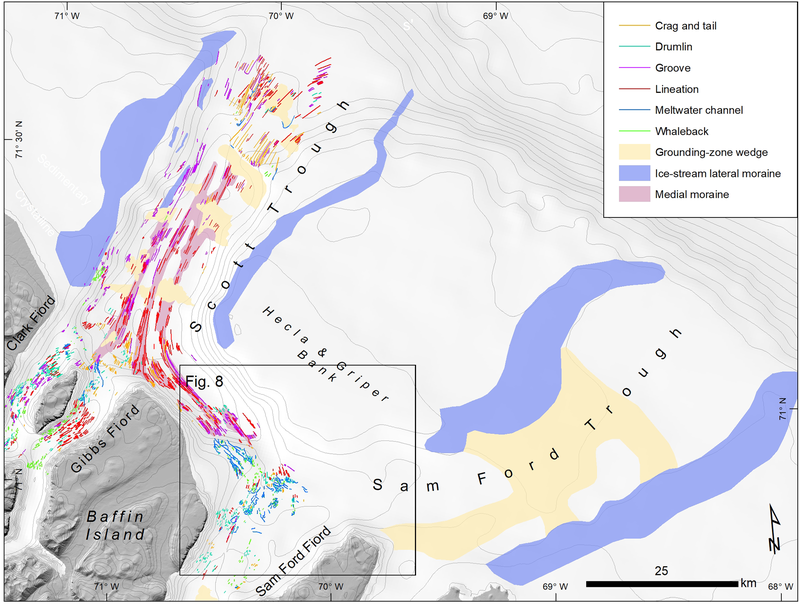 Bennett, R., Campbell, D. C., Furze, M. F. A., and Haggart, J. W.: The shallow stratigraphy and geohazards of the Northeast Baffin Shelf and Lancaster Sound, B. Can. Petrol. Geol., 62, 217–231, 2014. Bishop, P.: Drainage rearrangement by river capture, beheading and diversion, Prog. Phys. Geog., 19, 449–473, 1995. bibitem1 Briner, J. P., Miller, G. H., Davis, P. T., and Finkel, R. C.: Cosmogenic exposure dating in arctic glacial landscapes: implications for the glacial history of northeastern Baffin Island, Arctic Canada, Can. J. Earth Sci., 42, 67–84, https://doi.org/10.1139/e04-102, 2005. Briner, J. P., Michelutti, N., Francis, D. R., Miller, G. H., Axford, Y., Wooller, M. J., and Wolfe, A. P.: A multi-proxy lacustrine record of Holocene climate change on northeastern Baffin Island, Arctic Canada, Quaternary Res., 65, 431–442, https://doi.org/10.1016/j.yqres.2005.10.005, 2006a. Briner, J. P., Miller, G. H., Davis, P. T., and Finkel, R. C.: Cosmogenic radionuclides from fiord landscapes support differential erosion by overriding ice sheets, Bull. Geol. Soc. Am., 118, 406–420, https://doi.org/10.1130/B25716.1, 2006b. Briner, J. P., Miller, G. H., Finkel, R., and Hess, D. P.: Glacial erosion at the fjord onset zone and implications for the organization of ice flow on Baffin Island, Arctic Canada, Geomorphology, 97, 126–134, https://doi.org/10.1016/j.geomorph.2007.02.039, 2008. Briner, J. P., Bini, A. C., and Anderson, R.S. : Rapid early Holocene retreat of a Laurentide outlet glacier through an Arctic fjord, Nat. Geosci., 2, 496–499, https://doi.org/10.1038/ngeo556, 2009. Brouard, E. and Lajeunesse, P.: Maximum extent and decay of the Laurentide Ice Sheet in Western Baffin Bay during the Last glacial episode, Scientific Reports, 7, 10711, https://doi.org/10.1038/s41598-017-11010-9, 2017. Brouard, E. and Lajeunesse, P.: Glacial to postglacial submarine landform assemblages in fiords of northeastern Baffin Island, Geomorphology, 330, 40–56, https://doi.org/10.1016/j.geomorph.2019.01.007, 2019. Brouard, E., Lajeunesse, P., Cousineau, P. A., Govare, É., and Locat, J.: Late Wisconsinan deglaciation and proglacial lakes development in the Charlevoix region, southeastern Québec, Canada, Boreas, 45, 754–772, https://doi.org/10.1111/bor.12187, 2016. Clark, C. D.: Mega-scale glacial lineations and cross-cutting ice-flow landformds, Earth Surf. Proc. Land., 18, 1–29, 1993. Clark, C. D., Hughes, A. L. C., Greenwood, S. L., Spagnolo, M., and Ng, F. S. L.: Size and shape characteristics of drumlins, derived from a large sample, and associated scaling laws, Quaternary Sci. Rev., 28, 677–692, https://doi.org/10.1016/j.quascirev.2008.08.035, 2009. Cofaigh, C. Ó., Evans, D. J. A., and Smith, I. R.: Large-scale reorganization and sedimentation of terrestrial ice streams during late Wisconsinan Laurentide Ice Sheet deglaciation, Bull. Geol. Soc. Am., 122, 743–756, https://doi.org/10.1130/B26476.1, 2010. Cook, S. J. and Swift, D. A.: Subglacial basins: Their origin and importance in glacial systems and landscapes, Earth-Science Rev., 115, 332–372, https://doi.org/10.1016/j.earscirev.2012.09.009, 2012. De Angelis, H. and Kleman, J.: Palaeo-ice streams in the Foxe/Baffin sector of the Laurentide Ice Sheet, Quaternary Sci. Rev., 26, 1313–1331, https://doi.org/10.1016/j.quascirev.2007.02.010, 2007. De Angelis, H. and Skvarca, P.: Glacier surge after ice shelf collapse, Science, 299, 1560–1562, https://doi.org/10.1126/science.1077987, 2003. Dowdeswell, J. A. and Fugelli, E. M. G.: The seismic architecture and geometry of grounding-zone wedges formed at the marine margins of past ice sheets, Bull. Geol. Soc. Am., 124, 1750–1761, https://doi.org/10.1130/B30628.1, 2012. Dowdeswell, J. A., Ottesen, D., and Rise, L.: Flow switching and large-scale deposition by ice streams draining former ice sheets, Geology, 34, 313–316, https://doi.org/10.1130/G22253.1, 2006. Dowdeswell, J. A., Ottesen, D., Evans, J., Cofaigh, C. Ó., and Anderson, J. B.:, Submarine glacial landforms and rates of ice-stream collapse, Geology, 36, 819–822, https://doi.org/10.1130/G24808A.1, 2008. Dowdeswell, E. K., Todd, B. J., and Dowdeswell, J. A.: Submarine medial moraines and convergent ice flow, Scott Inlet, Baffin Island, Arctic Canada, Geological Society, London, Memoirs, 46, 193–194, 2016. Dowdeswell, J. A., Canals, M., Jakobsson, M., Todd, B. J., Dowdeswell, E. K., and Hogan, K.: Atlas of submarine glacial landforms: modern, Quaternary and ancient, Geological Society of London, London, UK, 618 pp., 2016. Dyke, A. S.: An outline of North American deglaciation with emphasis on central and northern Canada, Developments in Quaternary Sciences, 2, 373–424, https://doi.org/10.1016/S1571-0866(04)80209-4, 2004. Ehlers, J. and Gibbard, P. L.: Extent and chronology of glaciations, Quaternary Sci. Rev., 22, 1561–1568, 2003. Engelhardt, H., Humphrey, N., Kamb, B., and Fahnestock, M.: Physical conditions at the base of a fast moving Antarctic ice stream, Science, 248, 57–59, 1990. Evans, D. J. A. and Hansom, J. D.: The edinburgh castle crag-and-tail, Scot. Geogr. Mag., 112, 129–131, https://doi.org/10.1080/14702549608554461, 1996. Felikson, D., Bartholomaus, T. C., Catania, G. A., Korsgaard, N. J., Kjær, K. H., Morlighem, M., Noël, B., Van Den Broeke, M., Stearns, L. A., Shroyer, E. L., Sutherland, D. A., and Nash, J. D.: Inland thinning on the Greenland ice sheet controlled by outlet glacier geometry, Nat. Geosci., 10, 366–369, https://doi.org/10.1038/ngeo2934, 2017. Fortier, Y. O. and Morley, L. W.: Geological unity of the Arctic Islands, T. Roy. Soc. Can., 50, 3–12, 1956. Graham, A. G. C. and Hogan, K. A.: Crescentic scours on palaeo-ice stream beds, Geological Society, London, Memoirs, 46, 221–222, 2016. Graham, A. G. C., Larter, R. D., Gohl, K., Hillenbrand, C. D., Smith, J. A., and Kuhn, G.: Bedform signature of a West Antarctic palaeo-ice stream reveals a multi-temporal record of flow and substrate control, Quaternary Sci. Rev., 28, 2774–2793, https://doi.org/10.1016/j.quascirev.2009.07.003, 2009. Graham, A. G. C., Larter, R. D., Gohl, K., Dowdeswell, J. A., Hillenbrand, C.D., Smith, J. A., Evans, J., Kuhn, G., and Deen, T.: Flow and retreat of the Late Quaternary Pine Island-Thwaites palaeo-ice stream, West Antarctica, J. Geophys. Res., 115, F03025, https://doi.org/10.1029/2009JF001482, 2010. Greenwood, S. L. and Clark, C. D.: Reconstructing the last Irish Ice Sheet 2: a geomorphologically-driven model of ice sheet growth, retreat and dynamics, Quaternary Sci. Rev., 28, 3101–3123, 2009. Herman, F., Beaud, F., Champagnac, J.-D., Lemieux, J.-M., and Sternai, P.: Glacial hydrology and erosion patterns: a mechanism for carving glacial valleys, Earth Planet. Sci Lett., 310, 498–508, 2011. Hogan, K. A., Dowdeswell, J. A., Noormets, R., Evans, J., and Ó Cofaigh, C.: Evidence for full-glacial flow and retreat of the Late Weichselian Ice Sheet from the waters around Kong Karls Land, eastern Svalbard, Quaternary Sci. Rev., 29, 3563–3582, https://doi.org/10.1016/j.quascirev.2010.05.026, 2010. Hosseinpour, M., Müller, R. D., Williams, S. E., and Whittaker, J. M.: Full-fit reconstruction of the Labrador Sea and Baffin Bay, Solid Earth, 4, 461–479, https://doi.org/10.5194/se-4-461-2013, 2013. Hughes, T.: On the pulling power of ice streams, J. Glaciol., 38, 125–151, https://doi.org/10.1017/S0022143000009667, 1992. Jakobsson, M., Mayer, L., Coakley, B., Dowdeswell, J. A., Forbes, S., Fridman, B., Hodnesdal, H., Noormets, R., Pedersen, R., Rebesco, M., Schenke, H. W., Zarayskaya, Y., Accettella, D., Armstrong, A., Anderson, R. M., Bienhoff, P., Camerlenghi, A., Church, I., Edwards, M., Gardner, J. V., Hall, J. K., Hell, B., Hestvik, O., Kristoffersen, Y., Marcussen, C., Mohammad, R., Mosher, D., Nghiem, S. V., Pedrosa, M. T., Travaglini, P. G., and Weatherall, P.: The International Bathymetric Chart of the Arctic Ocean (IBCAO) Version 3.0, Geophys. Res. Lett., 39, L12609, https://doi.org/10.1029/2012GL052219, 2012. Jamieson, S. S. R., Hulton, N. R. J., and Hagdorn, M.: Modelling landscape evolution under ice sheets, Geomorphology, 97, 91–108, 2008. Jansson, K. N., Stroeven, A. P., and Kleman, J.: Configuration and timing of Ungava Bay ice streams, Labrador-Ungava, Canada, Boreas, 32, 256–262, https://doi.org/10.1111/j.1502-3885.2003.tb01441.x, 2003. Jenner, K. A., Campbell, D. C., and Piper, D. J. W.: Along-slope variations in sediment lithofacies and depositional processes since the Last Glacial Maximum on the northeast Baffin margin, Canada, Mar. Geol., 405, 92–107, https://doi.org/10.1016/j.margeo.2018.07.012, 2018. Jezek, K., Wu, X., Gogineni, P., Rodríguez, E., Freeman, A., Rodriguez-Morales, F., and Clark, C. D.: Radar images of the bed of the Greenland Ice Sheet, Geophys. Res. Lett., 38, L01501, https://doi.org/10.1029/2010GL045519, 2011. Josehans, H. and Zevenhuizen, J.: The Late Pleistocene geology of the Labrador Shelf, Polar Res., 5, 351–354, https://doi.org/10.3402/polar.v5i3.6912, 1987. 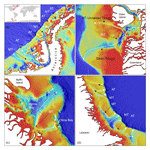 Joughin, I. and Alley, R. B.: Stability of the West Antarctic ice sheet in a warming world, Nat. Geosci., 4, 506–513, https://doi.org/10.1038/ngeo1194, 2011. Kessler, M. A., Anderson, R. S., and Briner, J. P.: Fjord insertion into continental margins driven by topographic steering of ice, Nat. Geosci., 1, 365–369, https://doi.org/10.1038/ngeo201, 2008. 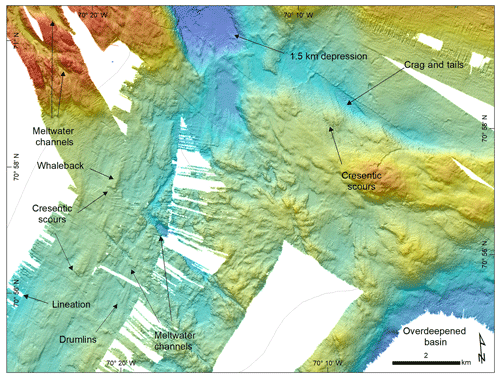 King, E. C., Woodward, J., and Smith, A. M.: Seismic and radar observations of subglacial bed forms beneath the onset zone of Rutford Ice Stream, Antarctica, J. Glaciol., 53, 665–672, https://doi.org/10.3189/002214307784409216, 2007. King, E. C., Hindmarsh, R. C. A., and Stokes, C. R.: Formation of mega-scale glacial lineations observed beneath a West Antarctic ice stream, Nat. Geosci., 2, 585–588, https://doi.org/10.1038/ngeo581, 2009. Kleman, J. and Applegate, P. J.: Durations and propagation patterns of ice sheet instability events, Quaternary Sci. Rev., 92, 32–39, https://doi.org/10.1016/j.quascirev.2013.07.030, 2014. Kleman, J., Hättestrand, C., Stroeven, A. P., Jansson, K. N., De Angelis, H., and Borgström, I.: Reconstruction of Palaeo-Ice Sheets – Inversion of their Glacial Geomorphological Record, Glacier Science and Environmental Change, chap. 38, 192–198, https://doi.org/10.1002/9780470750636.ch38, 2007. Krabbendam, M., Eyles, N., Putkinen, N., Bradwell, T., and Arbelaez-Moreno, L.: Streamlined hard beds formed by palaeo-ice streams: A review, Sediment. Geol., 338, 24–50, https://doi.org/10.1016/j.sedgeo.2015.12.007, 2016. Lajeunesse, P., Dietrich, P., and Ghienne, J.-F.: Late Wisconsinan grounding zones of the Laurentide Ice Sheet margin off the Québec North Shore (NW Gulf of St Lawrence), Geological Society, London, Special Publications, 475, 227–228, 2018. Livingstone, S. J., Ó Cofaigh, C., Stokes, C. R., Hillenbrand, C. D., Vieli, A., and Jamieson, S. S. R.: Antarctic palaeo-ice streams, Earth-Sci. Rev., 111, 90–128, https://doi.org/10.1016/j.earscirev.2011.10.003, 2012. Løken, O. H. and Hodgson, D. A.: On the Submarine Geomorphology Along the East Coast of Baffin Island, Can. J. Earth Sci., 8, 185–195, https://doi.org/10.1139/e71-020, 1971. Lowe, A. L. and Anderson, J. B.: Evidence for abundant subglacial meltwater beneath the paleo-ice sheet in Pine Island Bay, Antarctica, J. Glaciol., 49, 125–138, https://doi.org/10.3189/172756503781830971, 2003. MacLean, B., Williams, G., and Zhang, S.: New insights into the stratigraphy and petroleum potential of the Baffin shelf's Cretaceous rocks, B. Can. Petrol. Geol., 62, 289–310, https://doi.org/10.2113/gscpgbull.62.4.289, 2014. Margold, M., Stokes, C. R., and Clark, C. D.: Ice streams in the Laurentide Ice Sheet: Identification, characteristics and comparison to modern ice sheets, Earth-Sci. Rev., 143, 117–146, https://doi.org/10.1016/j.earscirev.2015.01.011, 2015a. Margold, M., Stokes, C. R., Clark, C. D., and Kleman, J.: Ice streams in the Laurentide Ice Sheet: a new mapping inventory, J. Maps, 11, 380–395, https://doi.org/10.1080/17445647.2014.912036, 2015b. Mercer, J. H.: West Antarctic ice sheet and CO2 greenhouse effect: A threat of disaster, Nature, 271, 321–325, https://doi.org/10.1038/271321a0, 1978. Nielsen, T., De Santis, L., Dahlgren, K. I. T., Kuijpers, A., Laberg, J. S., Nygård, A., Praeg, D., and Stoker, M. S.: A comparison of the NW European glaciated margin with other glaciated margins, Mar. Petrol. Geol., 22, 1149–1183, https://doi.org/10.1016/j.marpetgeo.2004.12.007, 2005. Nitsche, F. O., Gohl, K., Larter, R. D., Hillenbrand, C.-D., Kuhn, G., Smith, J. A., Jacobs, S., Anderson, J. 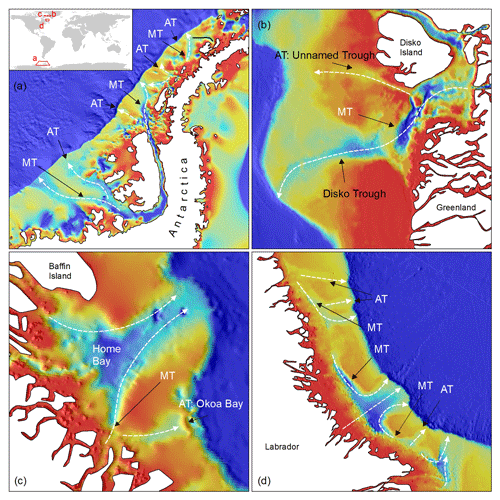 B., and Jakobsson, M.: Paleo ice flow and subglacial meltwater dynamics in Pine Island Bay, West Antarctica, The Cryosphere, 7, 249–262, https://doi.org/10.5194/tc-7-249-2013, 2013. Ó Cofaigh, C., Dowdeswell, J. A., Allen, C. S., Hiemstra, J. F., Pudsey, C. J., Evans, J., and Evans, D. J. A.: Flow dynamics and till genesis associated with a marine-based Antarctic palaeo-ice stream, Quaternary Sci. Rev., 24, 709–740, https://doi.org/10.1016/j.quascirev.2004.10.006, 2005. Ó Cofaigh, C., Evans, D. J. A., and Smith, I. R.: Large-scale reorganization and sedimentation of terrestrial ice streams during late Wisconsinan Laurentide Ice Sheet deglaciation, Bull. Geol. Soc. Am., 122, 743–756, https://doi.org/10.1130/B26476.1, 2010. Ó Cofaigh, C., Stokes, C. R., Lian, O. B., Clark, C. D., and Tulacyzk, S.: Formation of mega-scale glacial lineations on the Dubawnt Lake Ice Stream bed: 2. Sedimentology and stratigraphy, Quaternary Sci. Rev., 77, 210–227, https://doi.org/10.1016/j.quascirev.2013.06.028, 2013. Oakey, G. N. and Chalmers, J. A.: A new model for the Paleogene motion of Greenland relative to North America: plate reconstructions of the Davis Strait and Nares Strait regions between Canada and Greenland, J. Geophys. Res., 117, B10401, https://doi.org/10.1029/2011JB008942, 2012. Osterman, L. E. and Nelson, A. R.: Latest Quaternary and Holocene paleoceanography of the eastern Baffin Island continental shelf, Canada: benthic foraminiferal evidence, Can. J. Earth Sci., 26, 2236–2248, https://doi.org/10.1139/e89-190, 1989. Patton, H., Swift, D. A., Clark, C. D., Livingstone, S. J., and Cook, S. J.: Distribution and characteristics of overdeepenings beneath the Greenland and Antarctic ice sheets: Implications for overdeepening origin and evolution, Quaternary. Sci. Rev., 148, 128–145, 2016. Payne, A. J. and Dongelmans, P. W.: Self-organization in the thermomechanical flow of ice, J. Geophys. Res., 102, 12219–12233, https://doi.org/10.1029/97JB00513, 1997. Payne, A. J., Vieli, A., Shepherd, A. P., Wingham, D. J., and Rignot, E.: Recent dramatic thinning of largest West Antarctic ice stream triggered by oceans, Geophys. Res. Lett., 31, L23401, https://doi.org/10.1029/2004GL021284, 2004. Pelletier, B. R.: Development of submarine physiography in the Canadian Arctic and its relation to crustal movements, Report B.I.O. 64-16, Bedford Institute of Oceanography, 45 pp., 1964. Praeg, D., Maclean, B., and Sonnichsen, G.: Quaternary Geology of the Northeast Baffin Island Continental Shelf, Cape Aston to Buchan Gulf (70∘ to 72∘ N), Geological Survey of Canada Open File Report 5409, 98 pp., 2007. Price, S. F., Payne, A. J., Howat, I. M., and Smith, B. E.: Committed sea-level rise for the next century from Greenland ice sheet dynamics during the past decade, P. Natl. Acad. Sci. USA, 108, 8978–8983, https://doi.org/10.1073/pnas.1017313108, 2011. Reinardy, B. T. I., Larter, R. D., Hillenbrand, C. D., Murray, T., Hiemstra, J. F., and Booth, A. D.: Streaming flow of an Antarctic Peninsula palaeo-ice stream, both by basal sliding and deformation of substrate, J. Glaciol., 57, 596–608, https://doi.org/10.3189/002214311797409758, 2011. Retzlaff, R. and Bentley, C. R.: Timing of stagnation of ice stream C, West Antarctica, from short- pulse radar studies of buried surface crevasses, J. Glaciol., 39, 553–561, https://doi.org/10.1017/S0022143000016440, 1993. 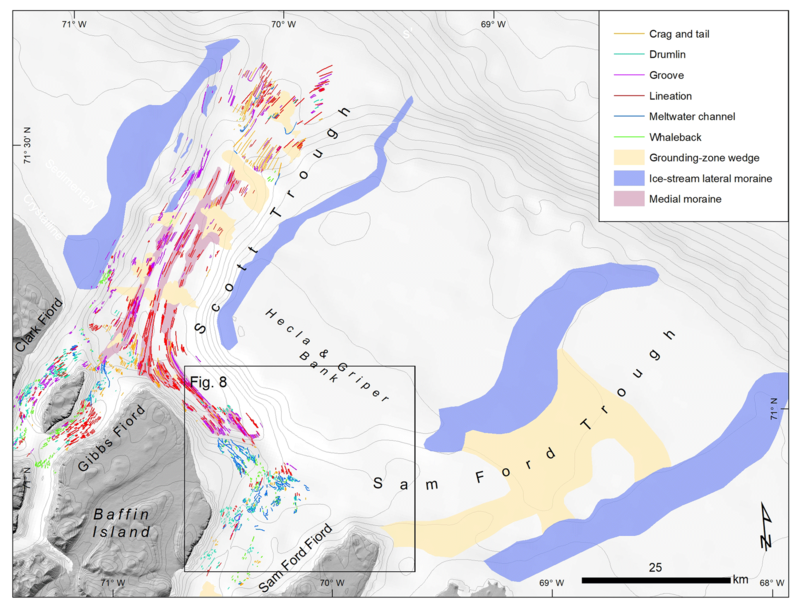 Roberts, D. H. and Long, A. J.: Streamlined bedrock terrain and fast ice flow, Jakobshavns Isbrae, West Greenland: Implications for ice stream and ice sheet dynamics, Boreas, 34, 25–42, https://doi.org/10.1111/j.1502-3885.2005.tb01002.x, 2005. Sarkar, S., Berndt, C., Chabert, A., Masson, D. G., and Minshull, T. A., and Westbrook, G. K.: Switching of a paleo-ice stream in northwest Svalbard, Quaternary Sci. Rev., 30, 1710–1725, https://doi.org/10.1016/j.quascirev.2011.03.013, 2011. Schoof, C.: Ice sheet grounding line dynamics: Steady states, stability, and hysteresis, J. Geophys. Res., 112, F03S28, https://doi.org/10.1029/2006JF000664, 2007. Simon, Q., Hillaire-Marcel, C., St-Onge, G., and Andrews, J. T.: North-eastern Laurentide, western Greenland and southern Innuitian ice stream dynamics during the last glacial cycle, J. Quaternary Sci., 29, 14–26, https://doi.org/10.1002/jqs.2648, 2014. Slabon, P., Dorschel, B., Jokat, W., and Freire, F.: Bedrock morphology reveals drainage network in northeast Baffin Bay, Geomorphology, 303, 133–145, https://doi.org/10.1016/j.geomorph.2017.11.024, 2018. Smith, J. A., Hillenbrand, C.-D., Larter, R. D., Graham, A. G. C., and Kuhn, G.: The sediment infill of subglacial meltwater channels on the West Antarctic continental shelf, Quaternary Res., 71, 190–200, 2009. Stokes, C. R. and Clark, C.D. : Are long subglacial bedforms indicative of fast ice flow?, Boreas 31, 239–249, https://doi.org/10.1111/j.1502-3885.2002.tb01070.x, 2002a. Stokes, C. R. and Clark, C. D.: Ice stream shear margin moraines, Earth Surf. Proc. Land., 27, 547–558, https://doi.org/10.1002/esp.326, 2002b. Stokes, C. R., Clark, C. D., and Storrar, R.: Major changes in ice stream dynamics during deglaciation of the north-western margin of the Laurentide Ice Sheet, Quaternary Sci. Rev., 28, 721–738, https://doi.org/10.1016/j.quascirev.2008.07.019, 2009. Stokes, C. R., Tarasov, L., and Dyke, A. S.: Dynamics of the North American Ice Sheet Complex during its inception and build-up to the Last Glacial Maximum, Quaternary Sci. Rev., 50, 86–104, https://doi.org/10.1016/j.quascirev.2012.07.009, 2012. Stokes, C. R., Margold, M., Clark, C. D., and Tarasov, L.: Ice stream activity scaled to ice sheet volume during Laurentide Ice Sheet deglaciation, Nature, 530, 322–326, https://doi.org/10.1038/nature16947, 2016. Storrar, R. D., Jones, A. H., and Evans, D. J. A.: Small-scale topographically-controlled glacier flow switching in an expanding proglacial lake at Breiðamerkurjökull, SE Iceland, J. Glaciol., 63, 745–750, https://doi.org/10.1017/jog.2017.22, 2017. Ugelvig, S. V., Egholm, D. L., Anderson, R. S., and Iverson, N. R.: Glacial Erosion Driven by Variations in Meltwater Drainage, J. Geophys. Res.-Earth, 123, 2863–2877, https://doi.org/10.1029/2018JF004680, 2018. Vaughan, D. G., Corr, H. F. J., Smith, A. M., Pritchard, H. D., and Shepherd, A.: Flow-switching and water piracy between Rutford ice stream and Carlson inlet, West Antarctica, J. Glaciol., 54, 41–48, https://doi.org/10.3189/002214308784409125, 2008. Winsborrow, M. C. M., Stokes, C. R., and Andreassen, K.: Ice-stream flow switching during deglaciation of the southwestern Barents Sea, Bull. Geol. Soc. Am., 124, 275–290, https://doi.org/10.1130/B30416.1, 2012. Modifications in ice-stream networks have major impacts on ice sheet mass balance and global sea level. However, the mechanisms controlling ice-stream switching remain poorly understood. We report a flow switch in an ice-stream system that occurred on the Baffin Island shelf through the erosion of a marginal trough. Up-ice propagation of ice streams through marginal troughs can lead to the piracy of neighboring ice catchments, which induces an adjacent ice-stream switch and shutdown.